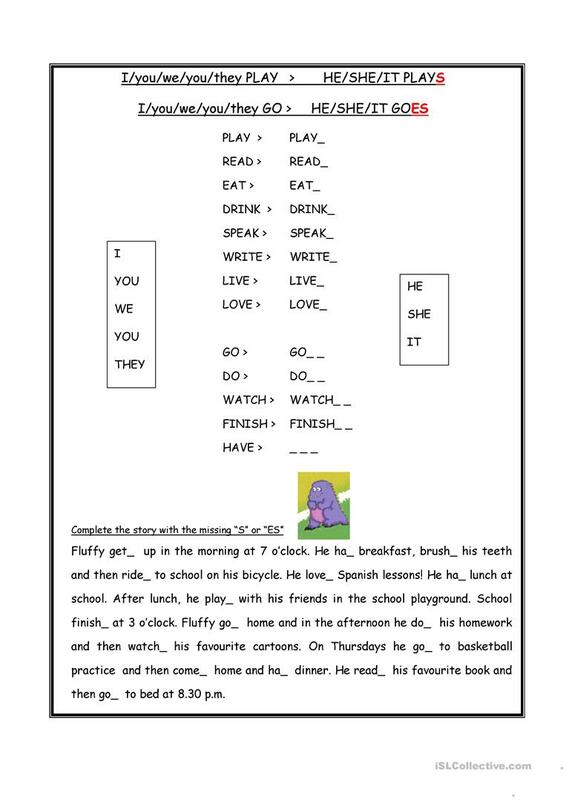 This is a worksheet that introduces the simple present, 3rd person singular (he,she,it) for some simple verbs (play, read, eat, drink, etc.). It also includes a few that take the "-es" ending (go, do, watch, etc.) and "have/has". Students read the story of Fluffy (his daily routine) and have to add "-s" or "-es" to the verbs. The above downloadable printable is intended for elementary school students at Beginner (pre-A1) and Elementary (A1) level. It is great for consolidating Present simple tense in English, and is a valuable material for developing your students' Writing skills. It is about the topic and words of Daily routines. alexbi is from/lives in Italy and has been a member of iSLCollective since 2012-12-16 23:03:42. alexbi last logged in on 2019-04-08 15:42:55, and has shared 31 resources on iSLCollective so far.